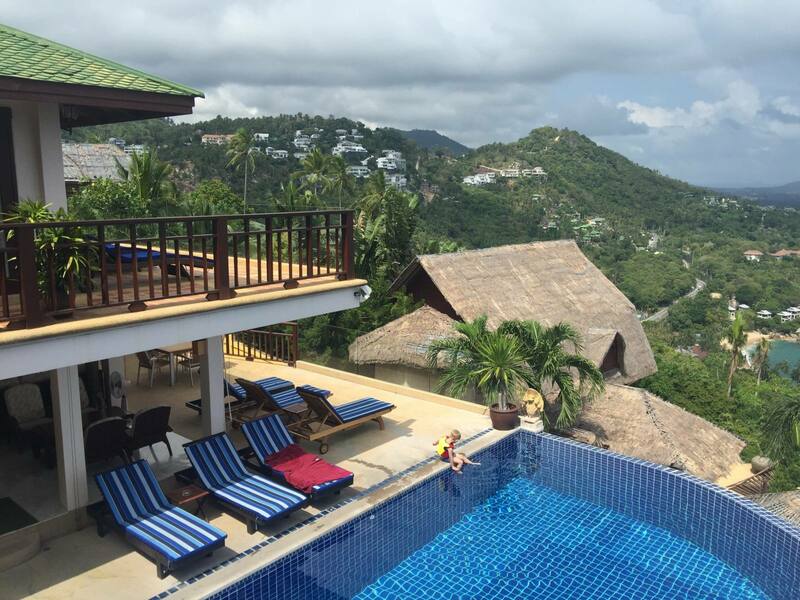 In Thailand we were able to swim often, and enjoyed some beautiful swimming pools in the hotels. We were sent some Konfidence buoyancy products to review while we were away. First up is this brilliant swim float suit by Konfidence. James wears age 4-5, and it fits him really well, I think. The suit zips up at the back, and has 4 pieces of polystyrene in the front, inside pouches, and 4 pieces of polystyrene at the back. James is wearing the clownfish design. 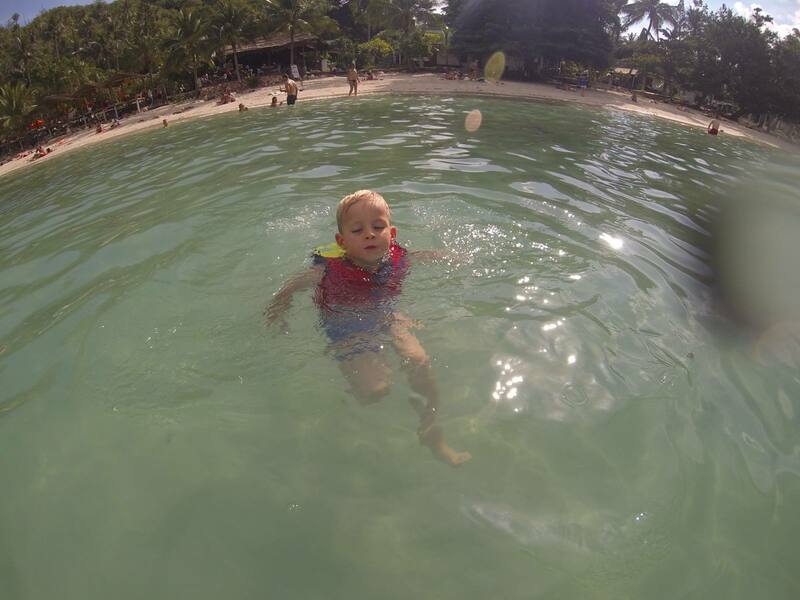 From the very beginning, James was able to swim by himself, which was thrilling to him. He has swimming lessons at home and he really enjoys those, with his confidence increasing lesson by lesson. However, this was an amazing piece of kit for James because he could practice his “lion arms” without any fear of that sense of struggling after a while he seems to get. This holiday he has been able to build his stamina with regular races against me! I don’t think he would’ve had the courage to jump in the pool as often as he did without this suit. A lot of his happiness during swimming time depends on his trust of the adult – will they help him in the way he expects – and this float suit by Konfidence didn’t need talking to before he tried new things. As your child’s confidence grows you are easily able to remove buoyancy aids from their slots on the outside of the costume. It is recommended that you start with the front outer 2 inserts and then the rear 2 outer aids. Then you can remove the last 2 aids from the front and then the rear two, by which time your child should be completely water confident. Fairly quickly we realised he was able to manage well without the front two inserts, and we took those out. Unfortunately we then gave the pool attendant rather too much work as they floated off the edge of the infinity pool time and time again. The boys decided the inserts look a lot like remote controls, so they were watching cBeebies in the swimming pool! I took them upstairs where we lost them until we were packing to go home. We had a Konfidence Swim Vest for Noah, too. Noah is a little water baby when it comes to bath time, and he is so happy when I take him to Waves swimming pool in North Tyneside, but wearing this jacket was not his favourite thing. “No jack on. James jack on. Noah no,” he would say, quite firmly, after the first try. So here’s a photo of James wearing it – I chose this photo because you can see the bright yellow back, which is bound to be pretty handy at a beach. James was waiting for me at the side of the pool while I went up to the room to grab my sunglasses. Even though the child is buoyant wearing this swim aide, you need to have them fairly close to you, just in case anything happens. An example of that need happened to us – for some reason the zipper didn’t connect at the bottom when Noah was wearing it, which we didn’t spot as we had the top held on with the velcro strap. Poor little Noah began to worry when he took one step too deep, and it was a good job I was immediately at hand because he just wasn’t safe. Fortunately I was able to rethread the zipper and it was fine after that one incident. Please don’t let your children too far from you even though they might be very confident while wearing the swim vest. This jacket is made of neoprene, and has pieces of polystyrene inside, to make it float. 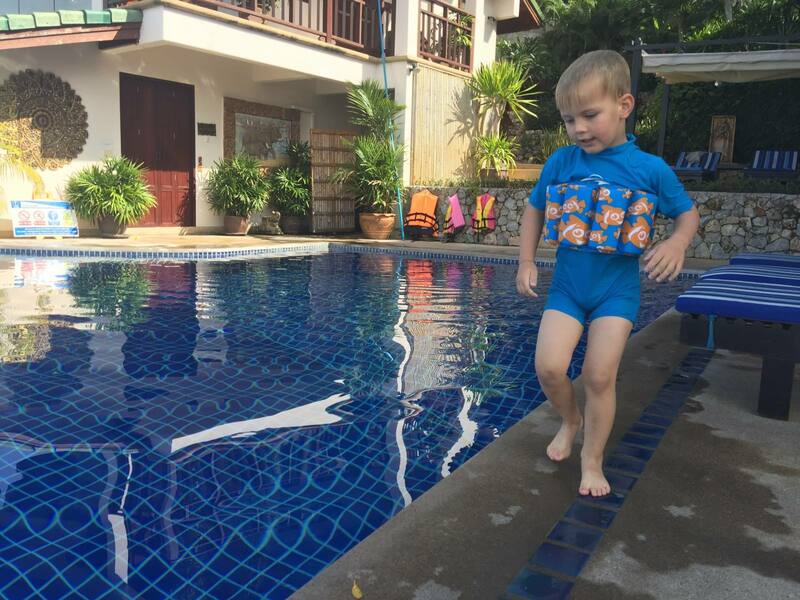 We were really surprised how quickly this Konfidence swim vest dries after use. It is soft to touch, and fit Noah well. He had the size 1-3, so I’m not really sure why he wasn’t keen (the zipper mis-threading incident happened at the end of our holiday, and he didn’t like this much right from the off). We also received an inflatable neoprene ball, which is a really clever way of taking a toy on holiday without taking up too much room in your case, or making your clothes stinky by taking a plastic inflatable. The boys loved to throw it about, and the neoprene outer makes it a bit grippier, and easier to catch in the water. As we were moving between bases in Thailand quite often, we were pleased that the neoprene dried quickly. Noah’s favourite thing by Konfidence is this pack of flashing toys. This would make a cute Christmas stocking stuffer, actually, or a good birthday gift for a baby or toddler who enjoys bath time. When the sea creatures come into contact with water they begin to flash. You can’t actually see that if you go swimming in the bright sunlight, but at dusk in Bangkok after a sweaty day exploring the city, a splash in the pool was very welcome. These flashing water toys by Konfidence were a huge hit. One thing to remember is that they must be dried on their side, because if the contact points stay wet the lights will continue to flash. 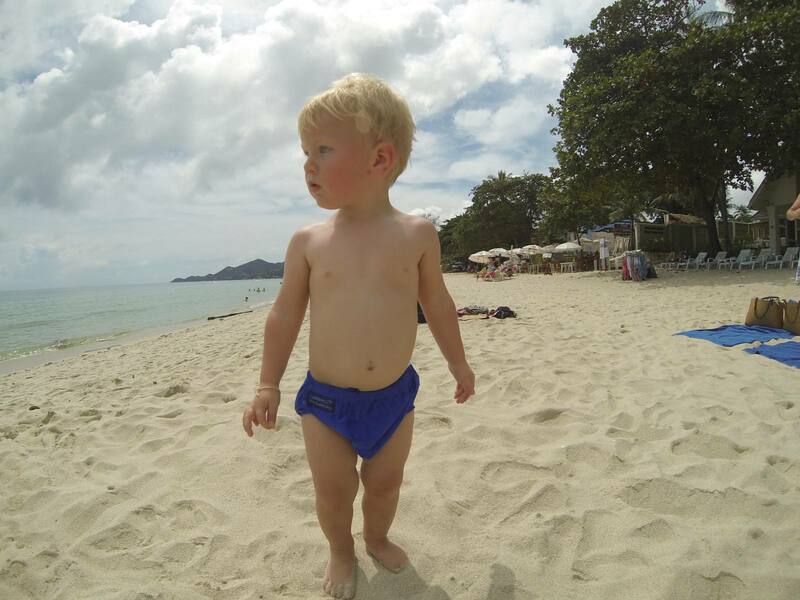 Finally we tested the Konfidence swim nappy. This is a one-size-fits-all nappy, and requires no other layers to ensure all solids are contained during swim time. At £9.99 I think this is really good value considering other neoprene-based swim nappies require a liner or disposable swim pant to be worn underneath. The swim nappy is fastened using both velcro and poppers. Noah is pretty much the middle of the age bracket you might use the nappy for, and we had it on just a bit more than the tightest fastening. Of course children get longer, and not really wider, so I do think the swim nappy will suit teenies to bigger toddlers. We didn’t get the erm, “opportunity” to test the feature of poop containment, however, I will say this nappy held sand remarkably well on the beach! Thanks to Konfidence for these products. Opinions and words are mine. Nice video of James swimming!